In 2011 a person from Australia and a person from Germany teamed up to offer enough funding to rescue an elephant from the logging industry and place it in our care at Elephant Village. At the time, we know of three elephants that were in need of rescue. 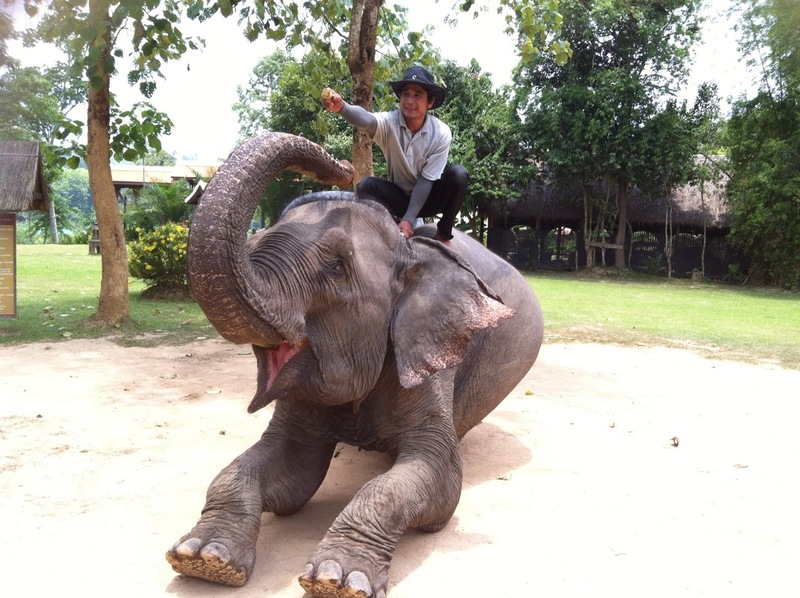 It was finally decided that Mae Kham Koun was the elephant that needed to be rescued the most. Mae Kham Koun has a very interesting and compelling past. In 2001 while working in the logging industry, she was injured when she stepped on a UXO (Un-Exploded Ordinance). She suffered the loss of part of her foot and is partially handicapped as a result. She is a very large Asian elephant. In fact, she is the largest in our care. She is also very strong, smart and gentle. She has been readily accepted by our herd and she gets along very well we all of the other elephants. Some believe that her injury may induce sympathy from the other elephants making them feel a special kindness towards her. We are very grateful to our friends from Australia and Germany who made it possible to rescue Mae Kham Koun. Mae Rai Kham with her mahout Mr. Lat. The story that the mahouts tell is that one day a tourist brought some bananas to the no-nonsense Mae Kham. Stretching out his hands, he offered the fruit to her but when she raised her trunk to take them, the tourist pulled them back. Mae Kham withdrew. The bananas were offered again. She stretched out her trunk but the tourist, teasing her, pulled them away again. On and on this went, until Mae Kham taught this cheeky tourist a lesson not soon forgotten. Let this be a lesson to you: Mae Kham has no time for jokes and she has a keen appetite. Preferred foods are bananas and bamboo. A female elephant of about 30 years of age, Mae Uak was purchased in 2004. Transporting her the 1,000 km from Pakse in the south of Laos to the camp was a very special task. 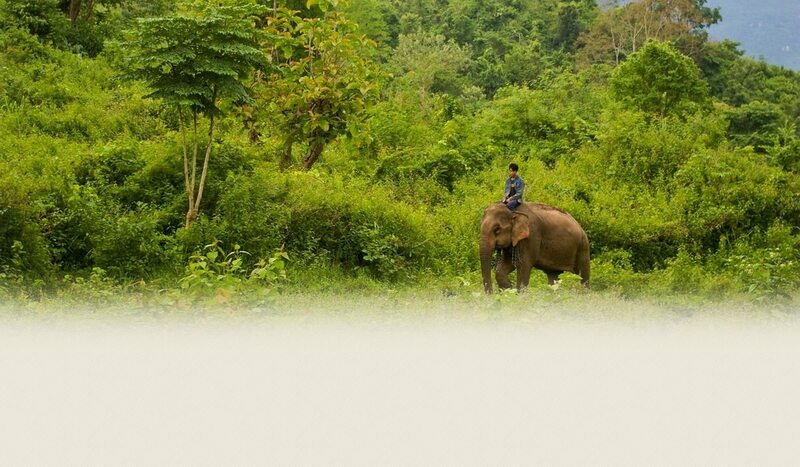 Because the elephants seemed very nervous, the truck that brought Mae Uak and her 60 year old mother to the camp in Xieng Lom near Luang Prabang had to drive for 36 hours without a break. 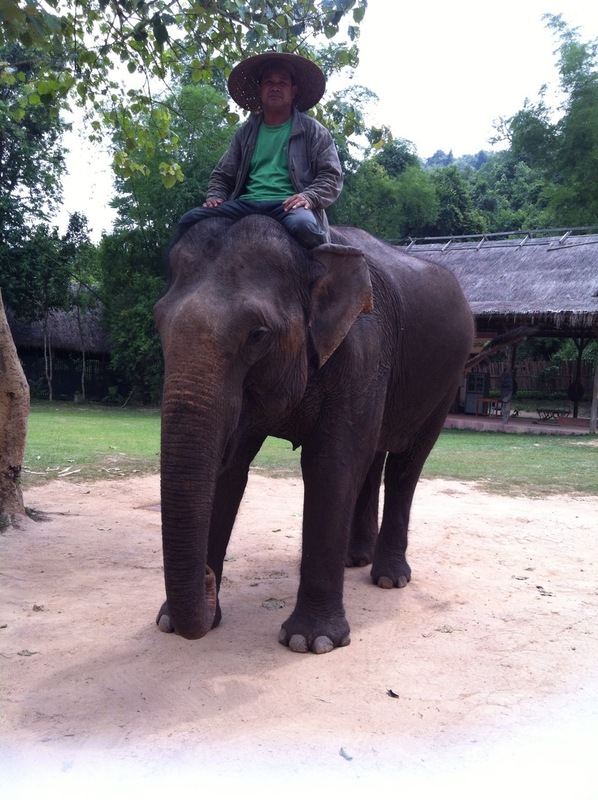 Despite heavy rains, a mahout had to sit on Mae Uak’s back for the whole journey, in order to keep her quiet. Three months later, Mae Uak’s mother died unexpectedly. Camp staff speculated that she was unable to adapt to her new surroundings, and especially to the new diet, that was completely different from what she had been eating in the south. An elephant veterinarian flown in from Thailand diagnosed worms in the liver and heavy digestion problems for both the mother elephant, as well as Mae Uak. Luckily, the camp was able to save Mae Uak’s life with careful monitoring and a change in diet. But the lesson of how elephants might react to changes in their surroundings, even if transported “only” from A to B in the same country, was a somber one. Mae Uak’s character is generally sociable, though sometimes strong-willed. She can be tended by each of the camp’s mahouts, something very unusual in an elephant. She seems perpetually hungry, and if one does not pay attention, she will quickly pull everything edible out of visitor’s pockets. Wherever there is something to eat, her trunk is there, as well. At feeding time, there are constant “trunk battles” for food between her and her herd-mates, the other elephant cows. Though quick with her trunk, Mae Uak is very slow when it comes to walking uphill, and she strictly refuses to pick up her pace in response to the mahout’s cues. Mae Uak is also very exceptional when it comes to the daily bath in the river. She is the only elephant that is able to submerge completely, and of course whoever is riding her goes under water too, to the delight of all the other mahouts. Sadly, Mae San’s generally sweet temperament has been manipulated against her in the past. Like all elephants in our camp, Mae San worked in the logging industry throughout her young adulthood. Pictures taken immediately after her arrival show the ways in which she was maltreated. Sensitive parts of her underweight frame showed furuncles and abscesses, caused by stabs from a knife. Eczema on the spots where the logging harness would have sat indicated that this elephant was used to pull the log much too heavy for her, and that she had to work without periods of rest. We also suspect that she was given drugs such as Amphetamine to enable her to work even harder and to satisfy human greed. It is especially unfortunate that, while she was skidding trees, a chain broke and caused Mae San to fall forward into some branches. One branch lacerated her right eye, and since then she has been blind on that side. Truly, the camp has been a lifesaver for Mae San. Initially, she was a bit difficult because with only one eye she took longer to get used to her new surroundings and her new mahout. Also it seemed that she was not used to extra food rations and quality care, which actually caused her to feel insecure as well. Now, however, she trusts her new situation. She seems to enjoy teamwork, and to feel most secure walking in line. It is truly gratifying to see how Mae San is recovering, and camp staff try not to worry themselves that she is a bit of a “dirty brat”, throwing mud on herself after each bath. 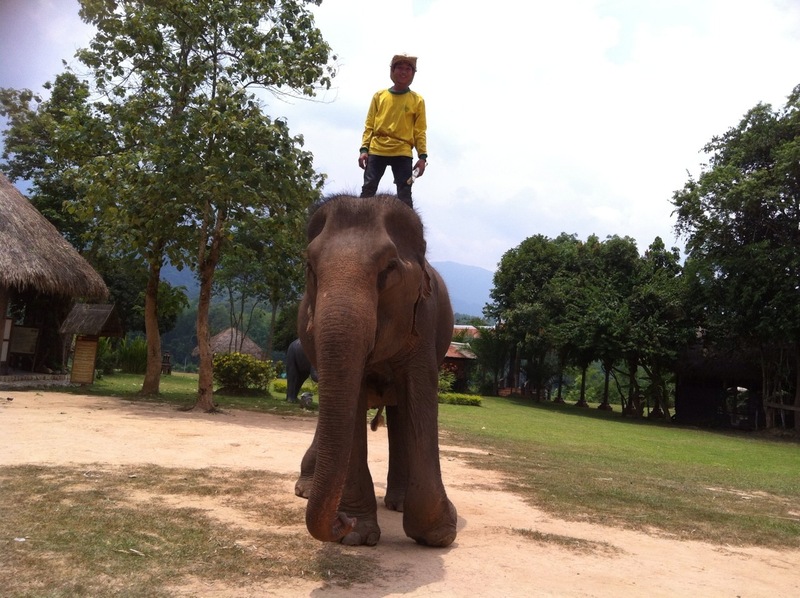 By the way, Mae San is the fastest and, with only 30 years to her credit, the youngest elephant of our team. 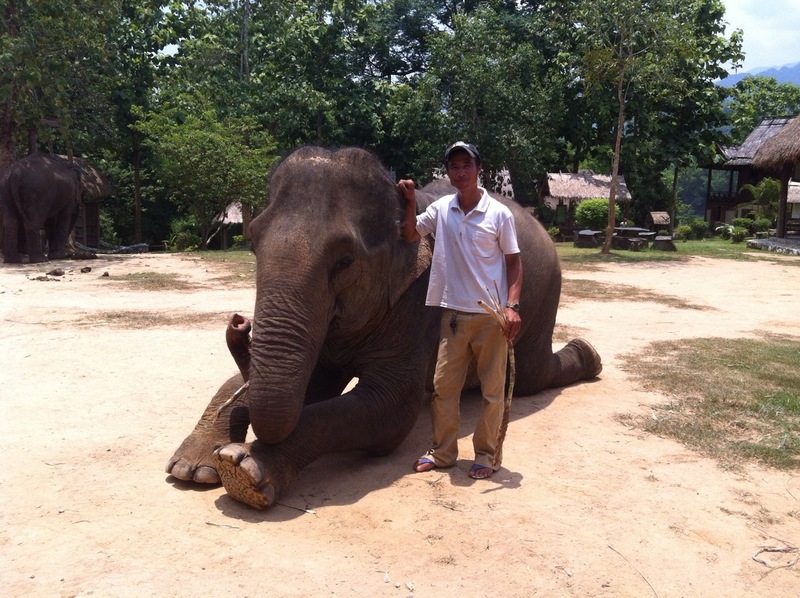 Mae Laem Tong with her mahout, Mr. Meud. Mr. Phaeng, who is also the rightful owner of Mae Buakham, has been together with her since they were both young. Since childhood Mae Buakham has had to work in the harsh logging industry. 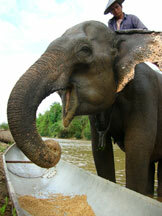 In 2005 she was able to break away from logging and began working with tourists at another elephant camp in Laos. We were happy to take her under our care in 2009. In 2002 Mae Buakham and Mr. Phaeng participated in a 100 day elephant caravan tour, which went from Hongsa (Sayaboury Province) to Pakse (Champasak Province) and back again. The caravan crossed 11 provinces and the walked about 20 km each day. This caravan was organized by the Lao government in cooperation with Elephant Asia in order to raise awareness of endangered Asian elephants. In October 2009, she finally began her stay here in our Elephant Village. She is very friendly with all of the other elephants in our herd.